The U.S. Bureau of Economic Analysis released 2012 personal income data by county and metropolitan area last week, along with comprehensive revisions to 2001-11 data. Given the local area detail and massive data collection process, this information does come out with a considerable time lag (11 months after the end of the year) but is by far the best data we have at the county level and forms the basis for much of our local level analysis. One interesting item in the data that I didn’t notice at first but was brought to my attention by our friends at the Bend Bulletin is the fact that income growth decelerated from 2011 to 2012. Growth was positive, so we are seeing gains, however the rate of growth in 2012 was slower than the rate of growth seen in 2011. What is going on here? First, the 2% payroll tax cut which was enacted at the beginning of 2011 and boosted workers’ paychecks. Typically payroll taxes subject from personal income since workers do not get to keep this income, however with the tax cut, it did contribute to stronger gains in 2011. This is shown by the green in the graph below. Consequently, the payroll tax cut was allowed to expire at the beginning of 2013 and therefore 2013 personal income will grow at a much slower pace due to the tax increase. Second, and most importantly for the deceleration, is a slower rate of growth in Dividends, Interest and Rent. In 2011, rental income and dividends grew at a 20% and 25% pace, respectively, at the national level (we don’t have detailed, broken out data on this category at the local level.) Rents were increasing nationally due to higher demand for rental properties and foreclosures were being converted to rentals as well. Dividends rebounded following the recession. 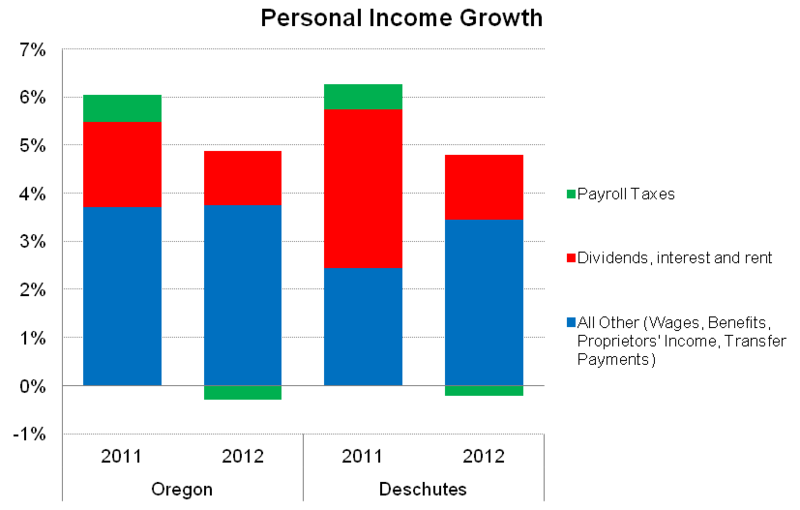 These trends boosted overall personal income growth considerably in 2011, accounting for 1.8 percentage points of the statewide 6.1% growth. 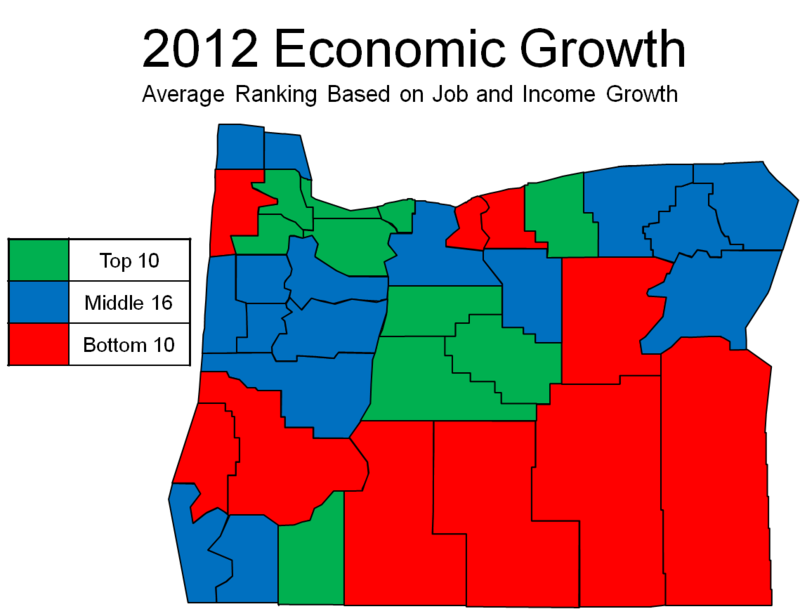 This was even more pronounced in Bend where the gains contributed 3.3 percentage points of the the area’s 6.3% growth. While Dividends, Interest and Rent continued to grow quickly in 2012, the rate was slower than the 2011 rebound, and thus contributed less to overall personal income gains. The most important aspect here to focus on are the blue portions in the graph, which represent all other types of personal income. In particular, wages and benefits for employees and business income all held steady in 2012 in terms of growth rates across the state or accelerated, as seen in Bend. These can be thought of as the underlying economic fundamentals and did not slow in 2012 relative to 2011, which is great news for economic growth. This phenomenon really is across the whole country. In fact if you dig into the full BEA data, you see that only 777 counties out of the 3,113 reporting data for recent years saw an acceleration in growth from 2011 to 2012, meaning the other 2,336 counties saw deceleration in growth. In Oregon, Crook and Jackson counties saw an acceleration in growth while the other 34 counties held steady or saw the rates of growth fall somewhat. 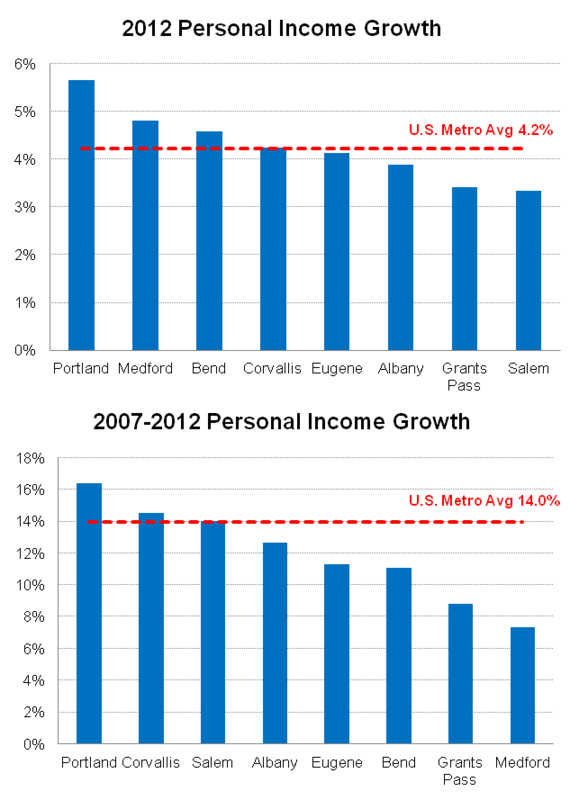 In terms of the state’s metropolitan areas 6 of 8 saw gains stronger than or in-line with the average across the country and over the full business cycle to date, just 3 Oregon MSAs have performed as well as the U.S. average. Lastly, to get a rough gauge on how each county performed economically in 2012, I ranked each one in terms of employment growth and personal income growth and took their average ranking between the two measures. This methodology is somewhat subjective, I realize, however it does show which counties are doing the best and which are doing the worst across these two important measures of economic health.